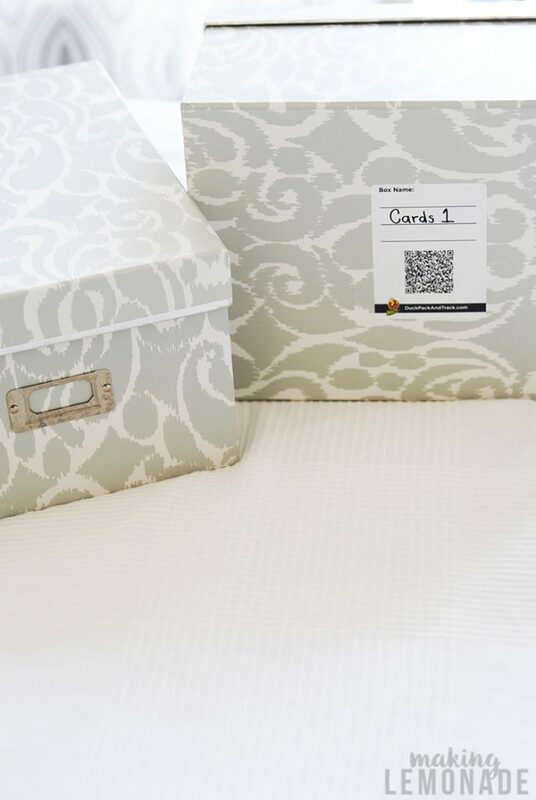 This package might look unassuming, but what’s lurking inside may be the most brilliant organization tool of the century– and I don’t say that lightly. In fact, might even break up with my label maker (GASP!) 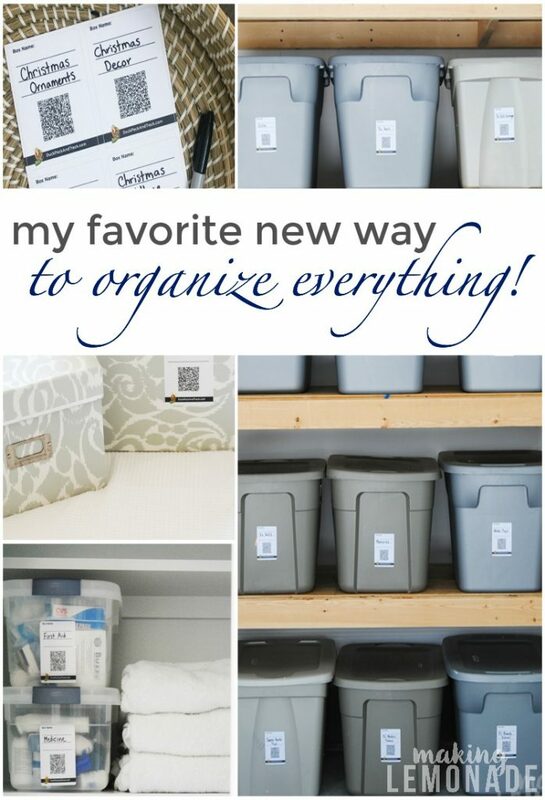 after seeing how these ingenious smart labels whipped my home into organizational bliss so efficiently. 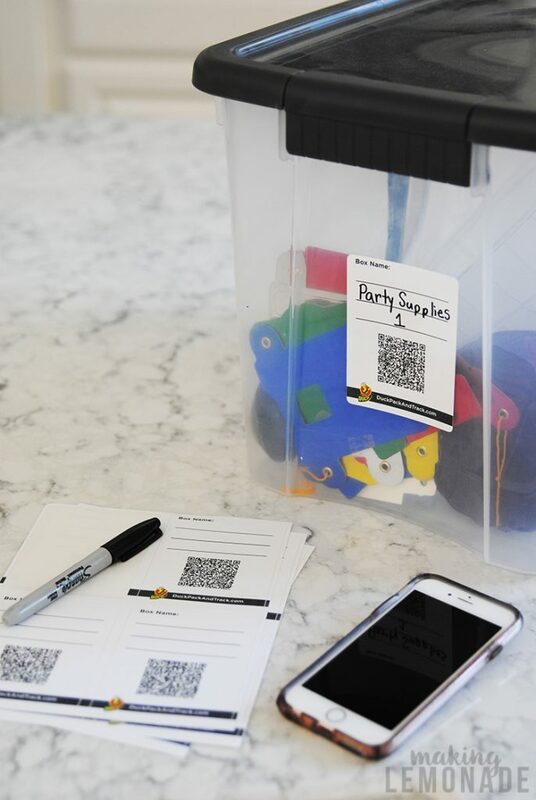 When I first received the Pack and Track labels from Duck Tape in partnership for this post, I knew they looked helpful but I didn’t realize they would be THIS amazing. In fact, when I opened the package and started playing with the free app, I let out a plaintive “whyyyyyyyyyyyyy didn’t I have these when we moved?? 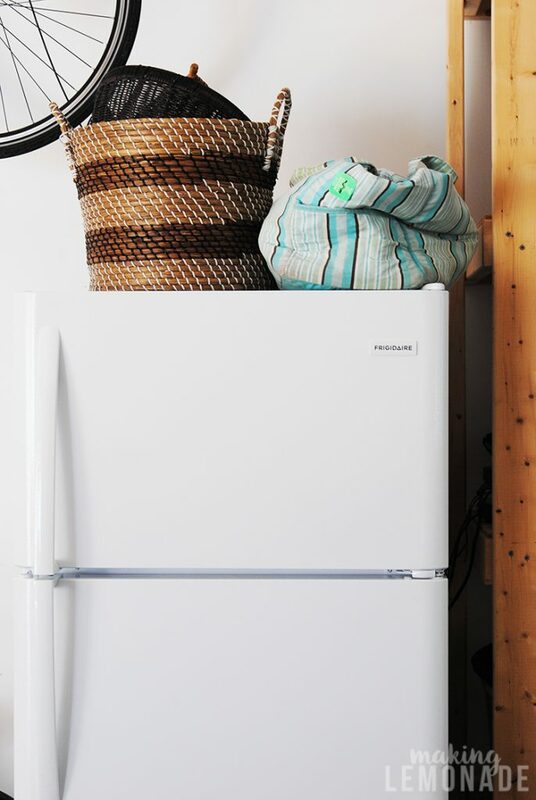 ?” because it would have make our complicated moving and storage situation SO much easier. 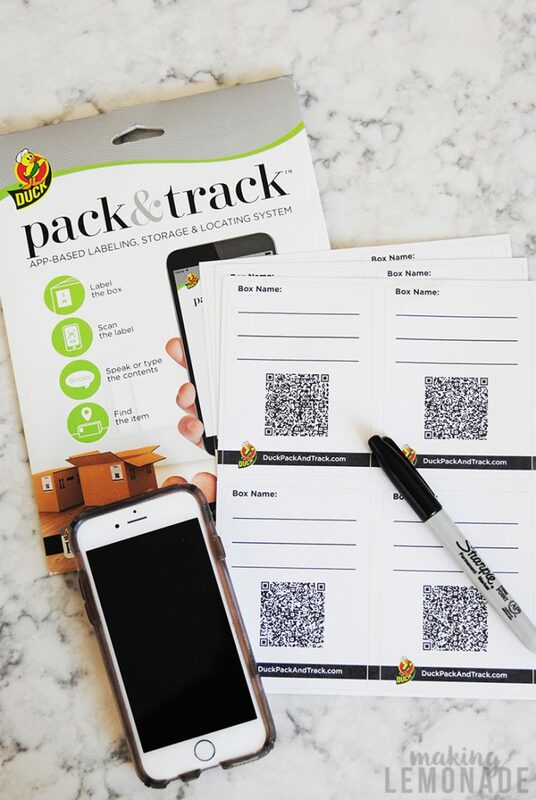 But the Pack and Track name is a bit misleading, as these simple-looking labels aren’t just for packing and moving– they’re so full of organization power they’ve unleashed a torrent of whole-home organizing that my muscles are still recovering from. 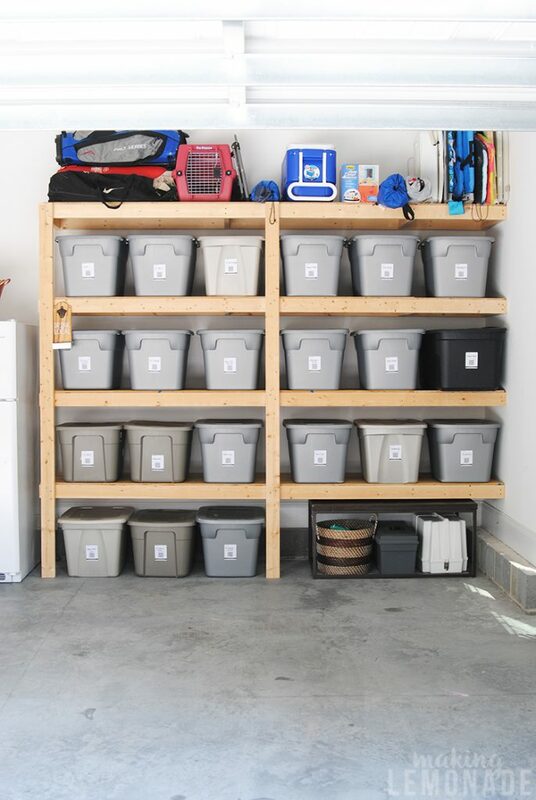 Despite the 100 degree temps this week, I went crazy organizing my garage. Got my daughter’s memory boxes into shape. 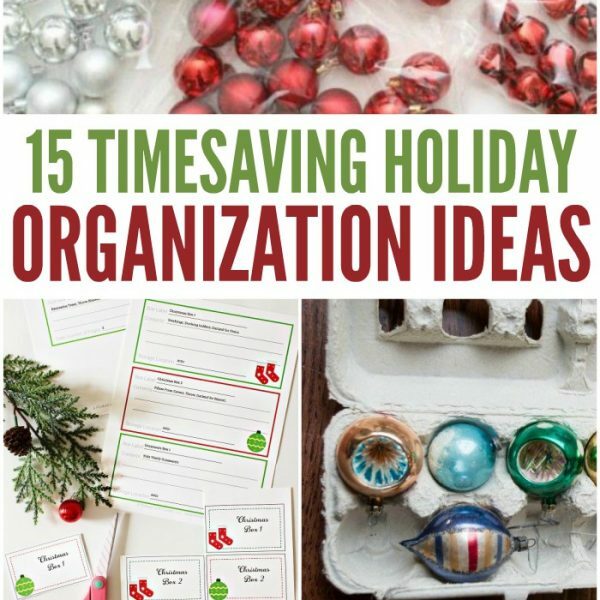 And now I’m in the process of organizing Christmas. What makes the Pack and Track labels unique? 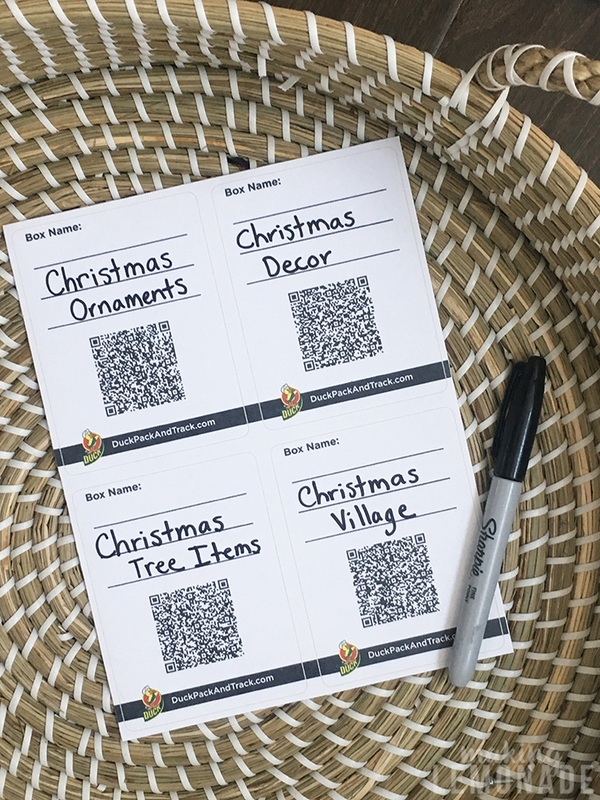 They have a QR code you scan into an app, and then you list the name, location, and contents of the box using either your voice or the phone’s keyboard. 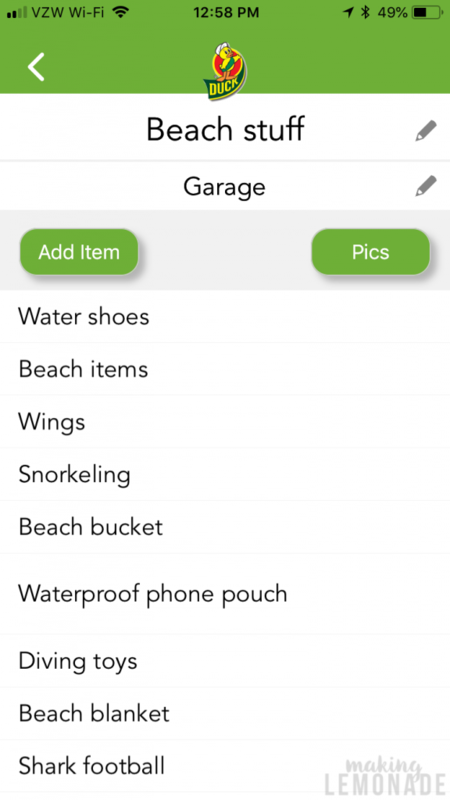 You can even add photos so you can see EXACTLY what’s in the box without having to shuffle things around and open it up. The app is incredibly user friendly. I loved the voice option so I didn’t have to get my phone dirty when typing with dusty hands when I was cleaning the garage. GENIUS. 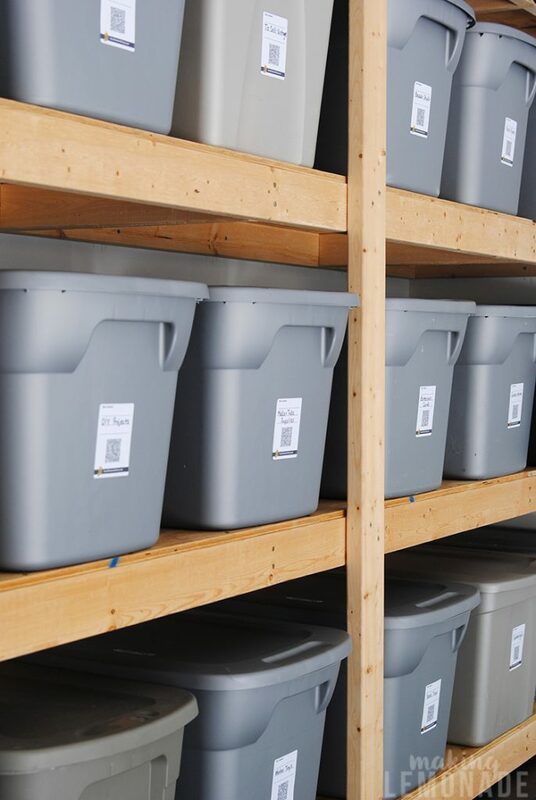 While the name is Duck Pack & Track™, the uses go way beyond packing and moving– it’s truly an organizational powerhouse. 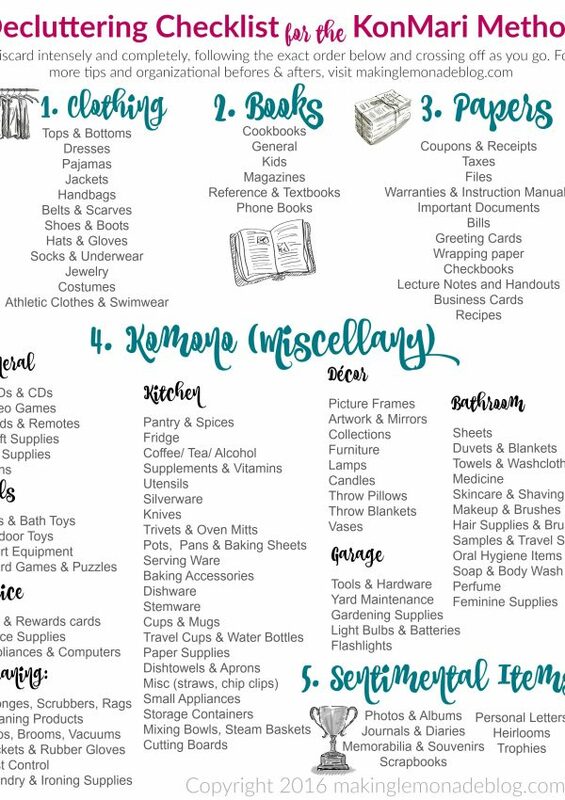 Here’s just a few ways you can use it to organize your entire home! We had stuff shoved everywhere, no rhyme or reason. Even our garage fridge wasn’t safe. 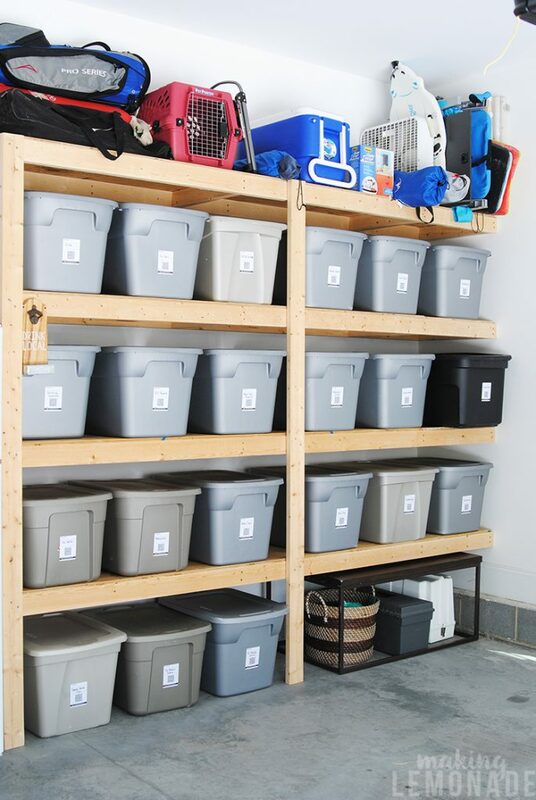 To make this happen, I counted how many bins would fit on our shelves and gathered all the gray bins we already had and bought the remaining ones we needed. 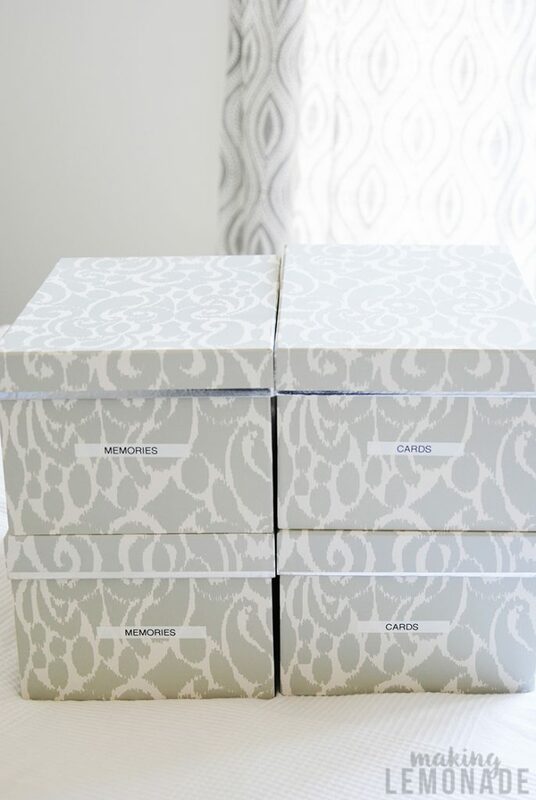 Then, I wrote a unique name on each label, measured 5″ down so they lined up neatly (definitely not necessary, but I really wanted them to look professional), and placed them on the bins. 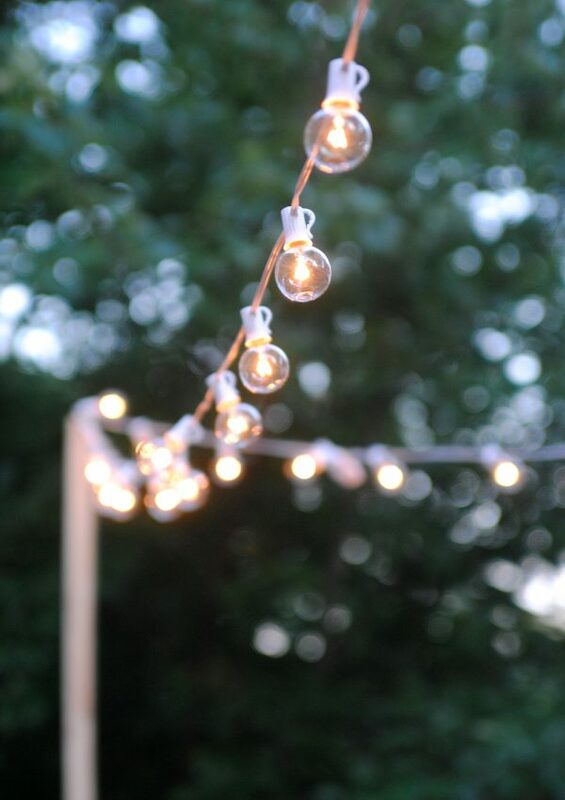 They adhere really well, so make sure they’re straight the first time you put them on! 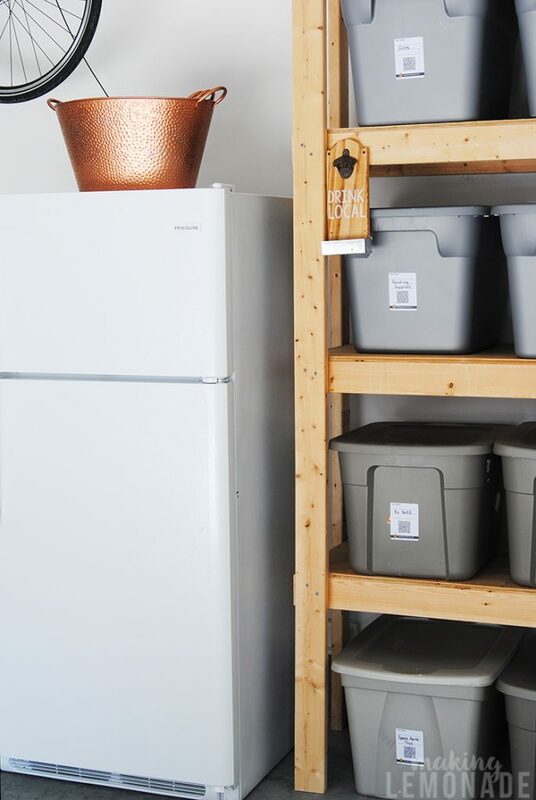 PRO TIP: when you buy storage bins, get them in a color that never goes out of style such as gray in case you need to add more a few years down the road. 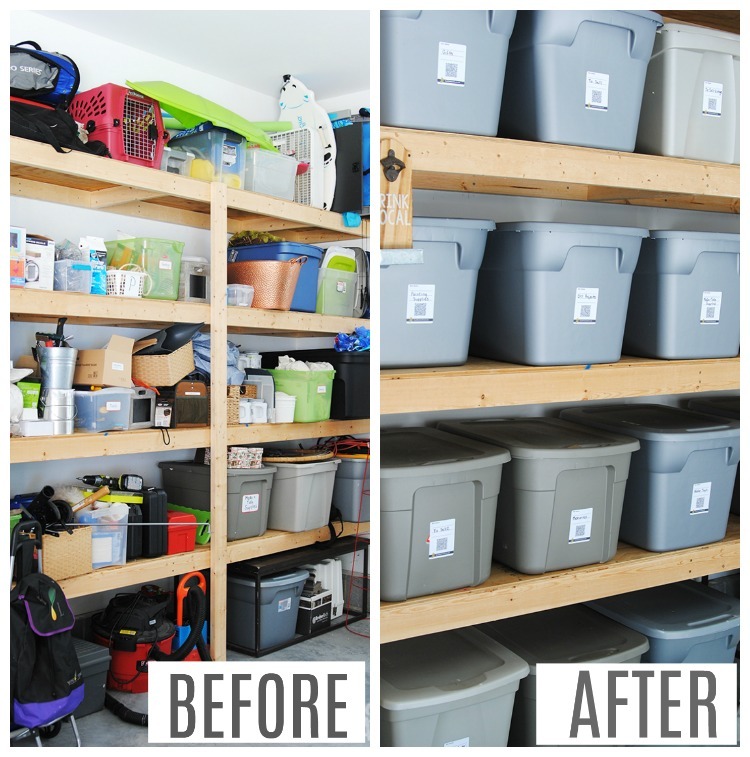 These shelves look cohesive because most of the bins are gray toned. Of course it’ll still work to use various colored bins, but I have to say the consistency here makes my heart skip a beat. 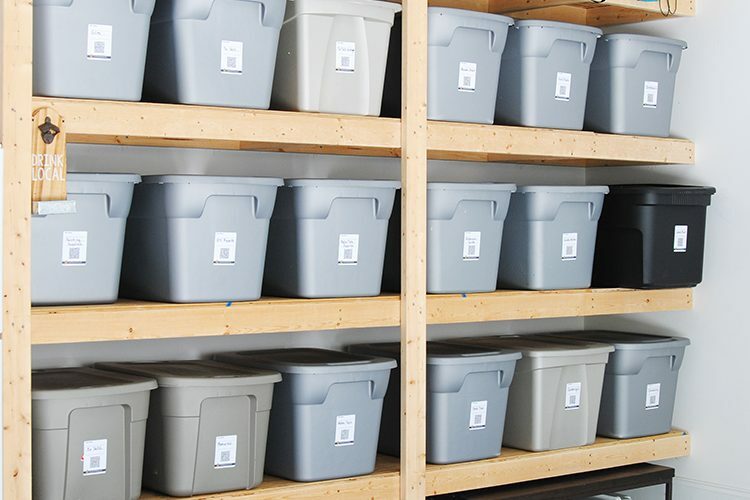 Some of these bins are 15 years old, and they blend with the new ones nicely because Sterilite has had a line of gray bins for as long as I can remember. 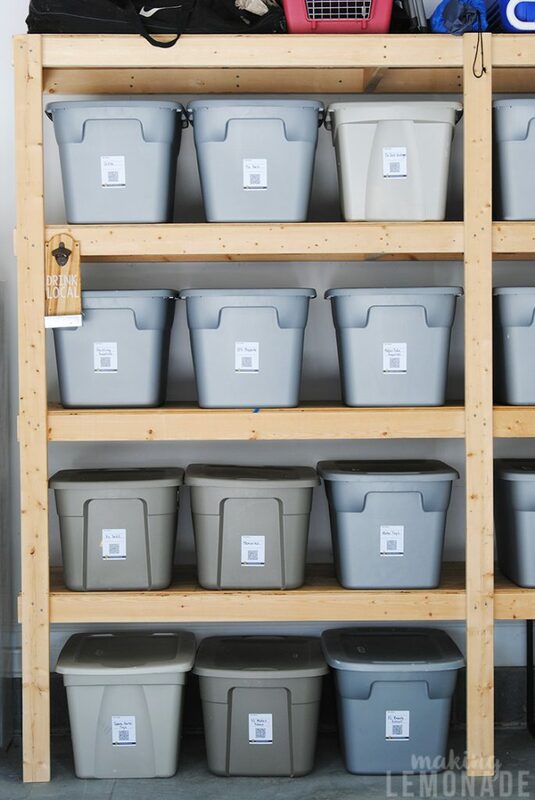 After labeling the bins, I sorted everything that had been previous shoved onto the shelves into them. 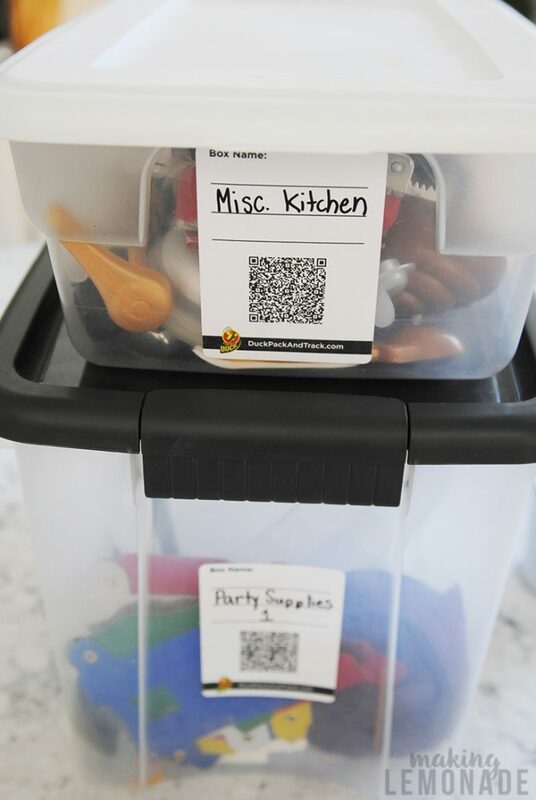 Once everything had a ‘home’, I scanned each bin and added the name and location (you can use either your voice or a keyboard to do this!). Then I snapped a pic or two so I can always see exactly what’s inside. 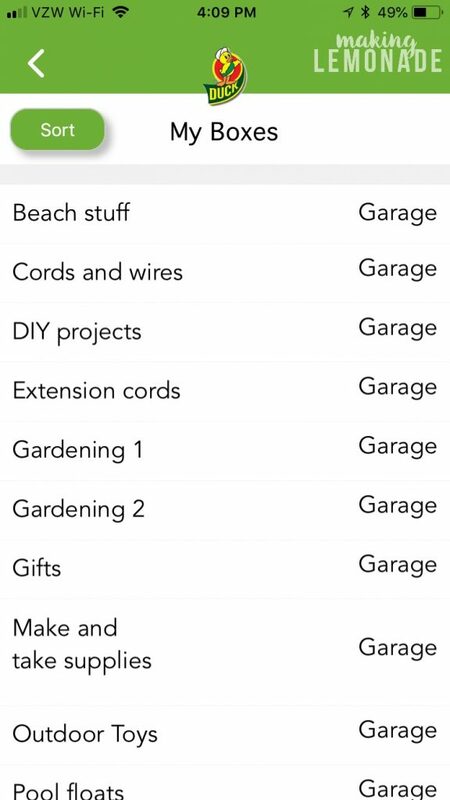 Last, I used the voice function to dictate the contents of each bin and BOOM, I had an inventory of everything in our garage in minutes. 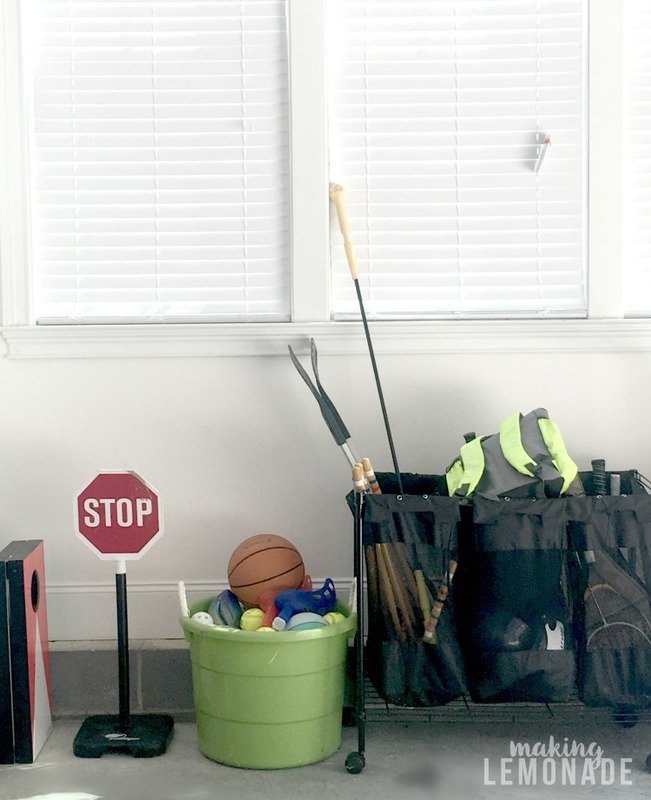 After organizing the garage, I was unstoppable. The kitchen was next. 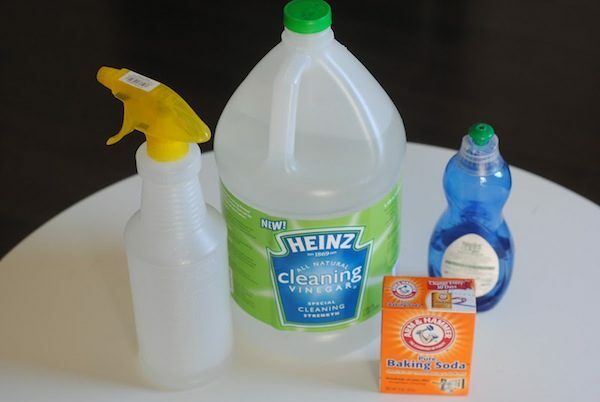 Whether you have empty cabinets or ones that are stuffed full, it can sometimes be tough to find miscellaneous cooking utensils. The one time a year I use my Pierogie maker I can never seem to find it, along with other random pieces. 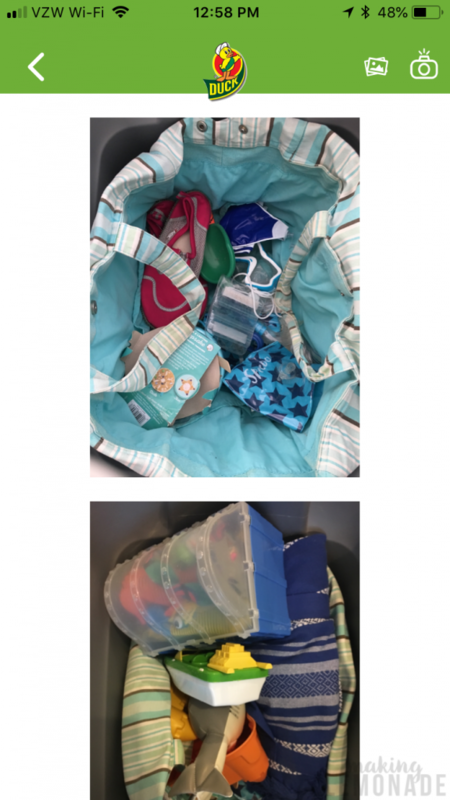 Duck Pack & Track™ solved that problem! 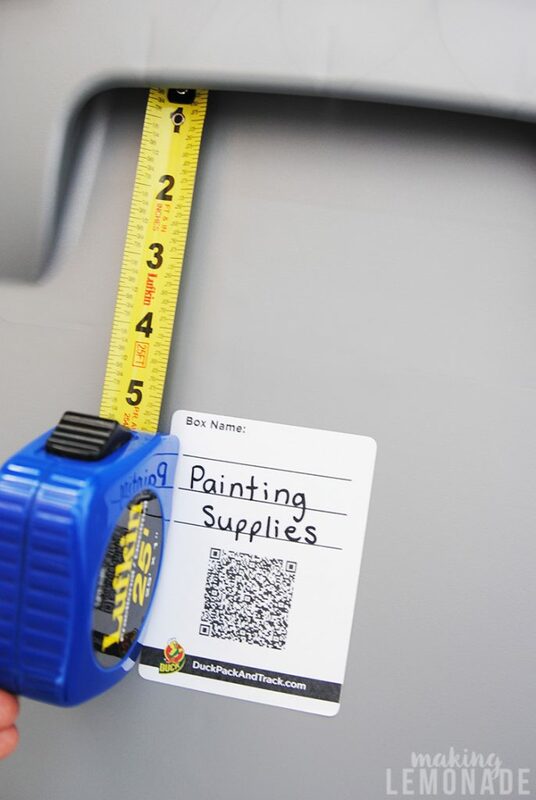 Scan, snap a pic, label, add items, done. Each birthday that rolls around, I misplace the streamers. NO MORE. 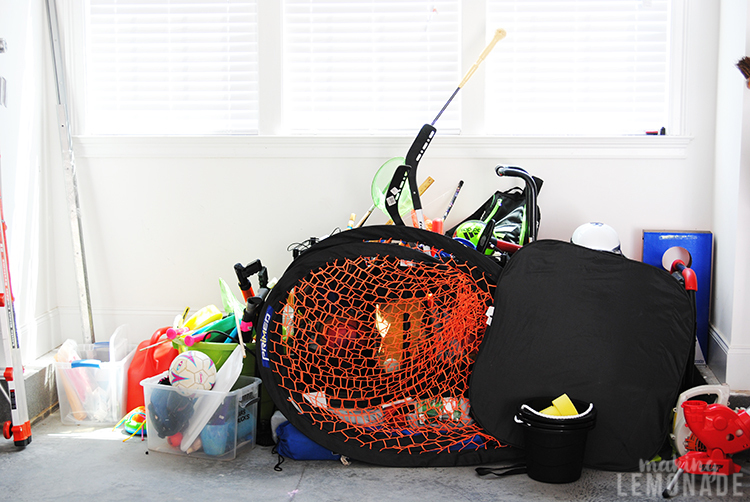 Now I know exactly where to find them, along with other party supplies– in my pantry! 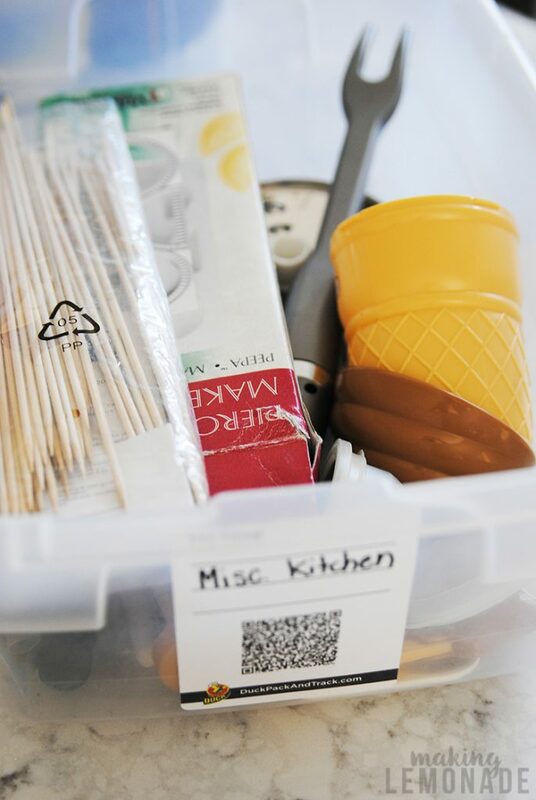 PRO TIP: if you want to use Pack and Track to find items in your kitchen island and cabinets, you could tape the label into the inside door so you know exactly which cabinet has what without having to use the adhesive backing in case you want to move it later. 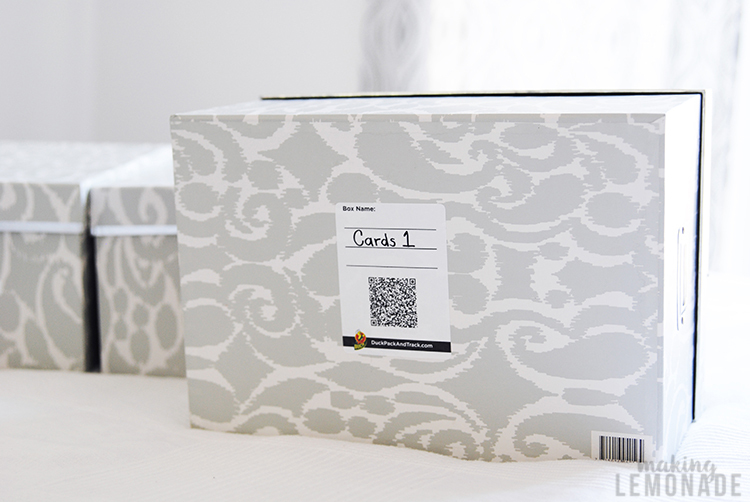 Next up were the memory, photo, and heirloom boxes. We have lots of these, so I started in my daughter’s room. 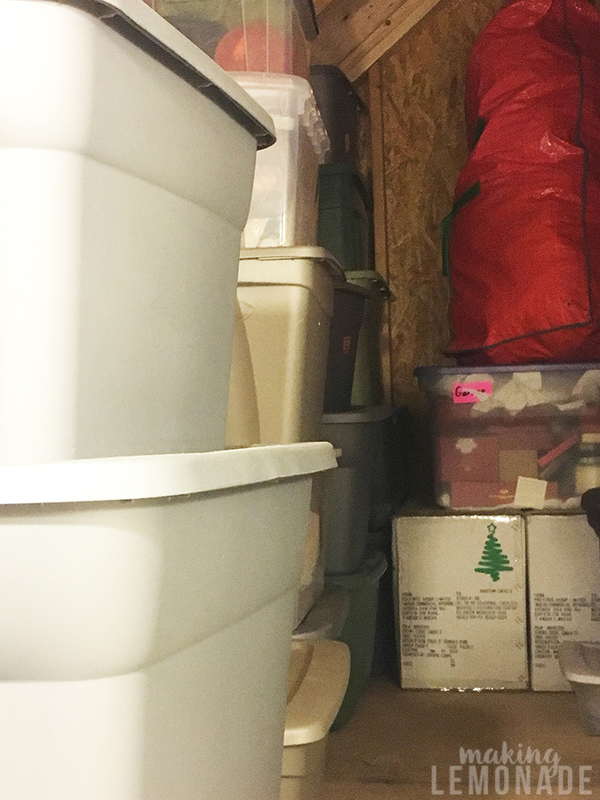 We have things sorted into boxes, but it can take awhile to find exactly what we’re looking for. 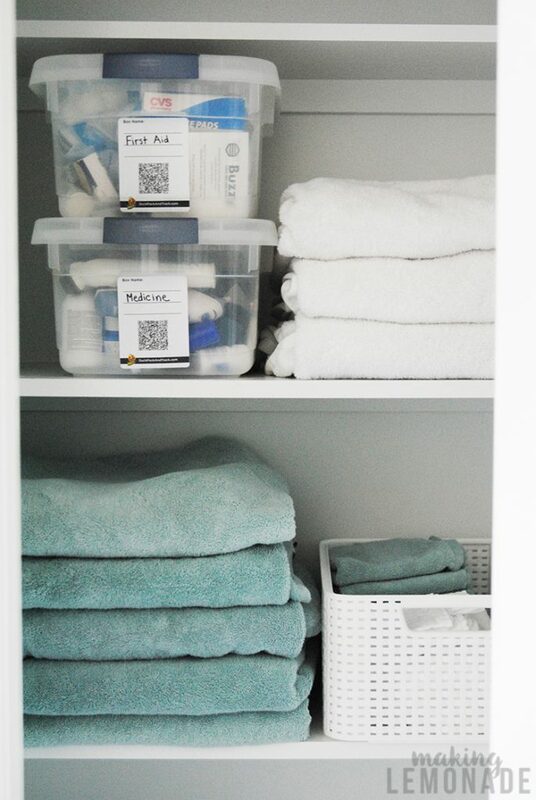 Another problem I wanted to solve was organizing and keeping track of first aid and medical supplies. 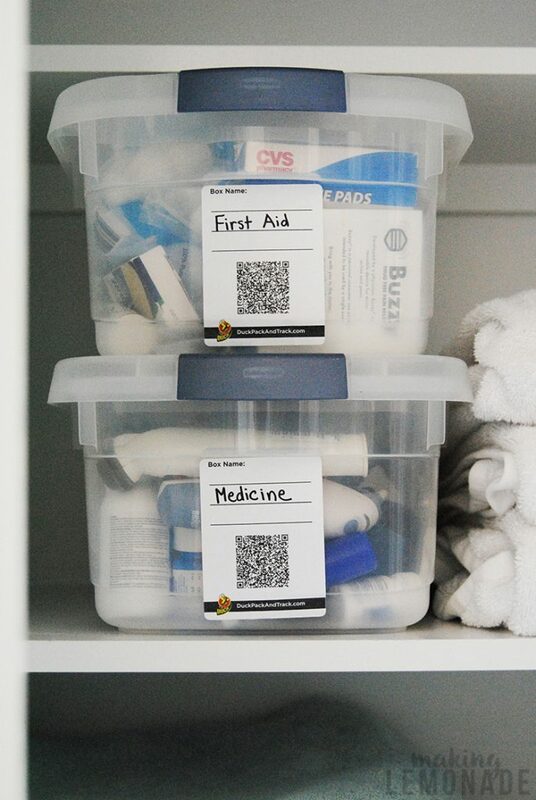 We have supplies in a few places in our home due to my daughter’s health history, so the labels made it easy to figure out what was where, and also get a snapshot of exactly what we have. Because when someone needs a Star Wars band-aid, they NEED a Star Wars bandaid NOW. 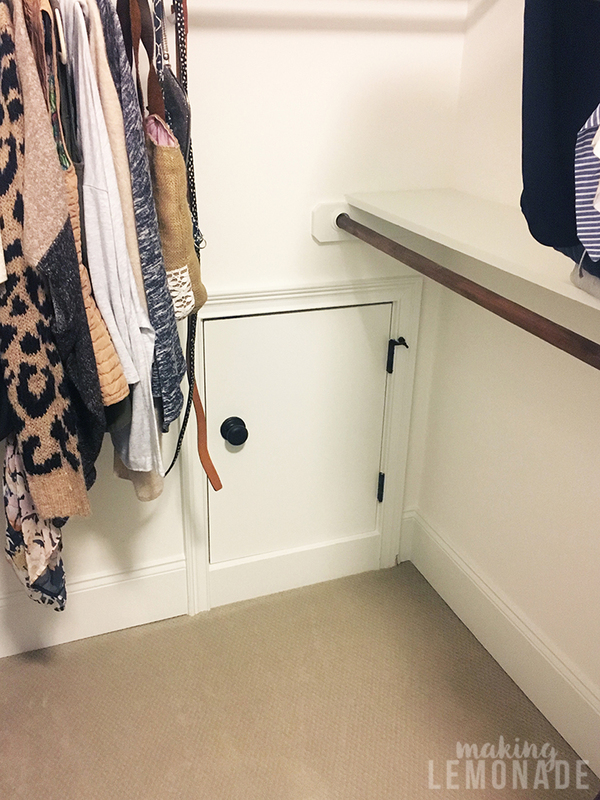 As for holiday decorations for Christmas and Easter, we have those boxes tucked away in a small space that can be accessed through what we call the ‘Hobbit door’ in my closet. This makes it really tough to get in there and search through bins when I need something! Since it’s almost 100 degrees today, I’m working on the labels now and will work on the actual bins when it cools down a bit. It’s going to be great to search ‘stockings’ or ‘tree skirt’ and be able to find the exact bin we need. Anywho, I’m equal parts blown away and inspired. 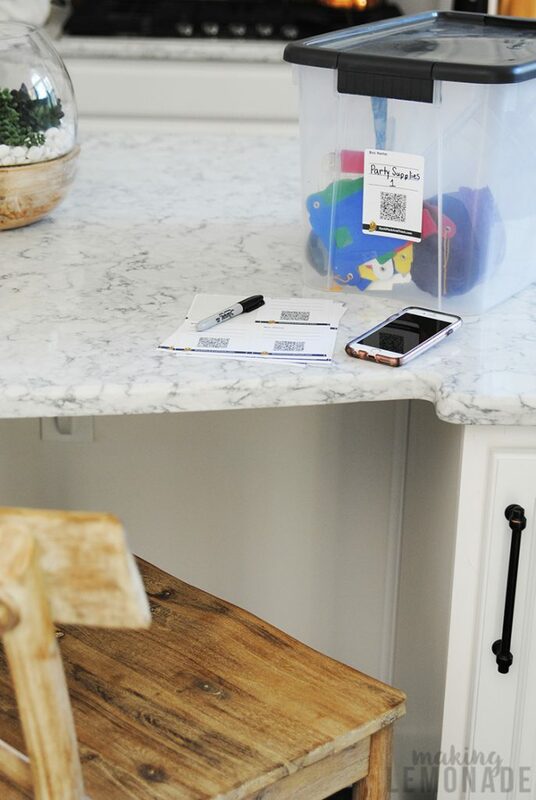 If you need me, I’ll be here, labeling away. 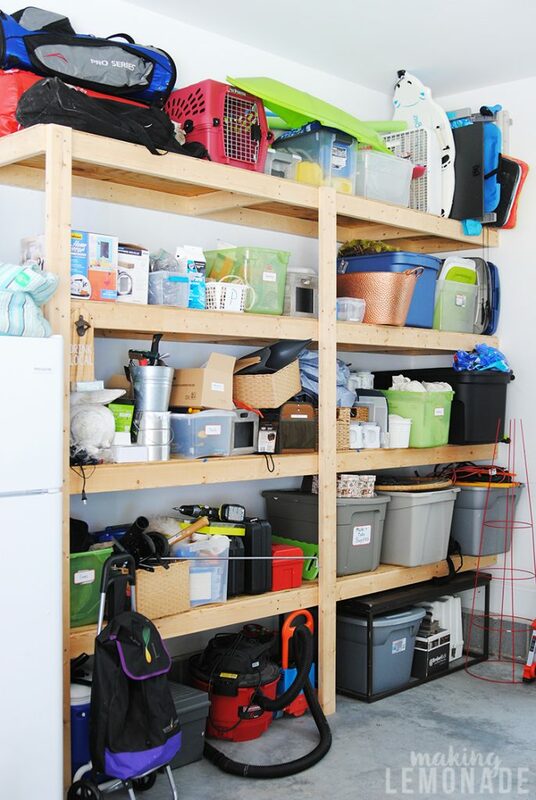 I still need to tackle our photos and closets. Am I weird for thinking this is fun? 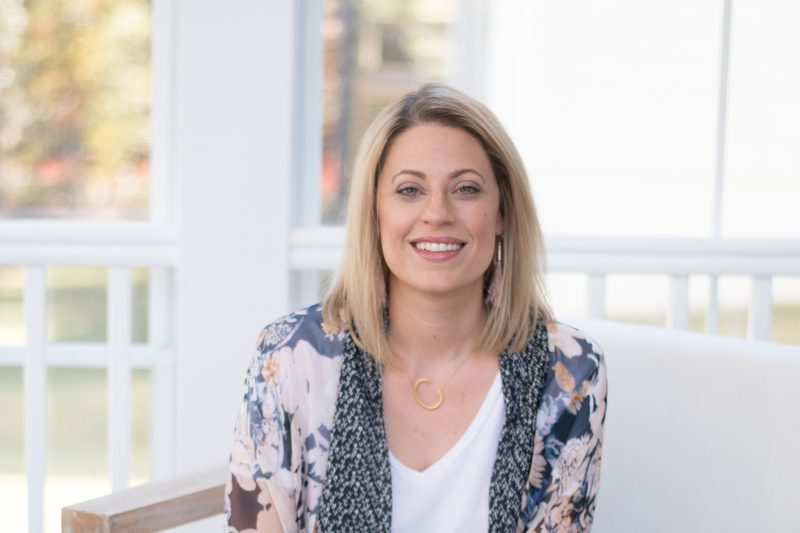 projects and ideas are based on my own experience. I had no idea these existed!! Wow!!! 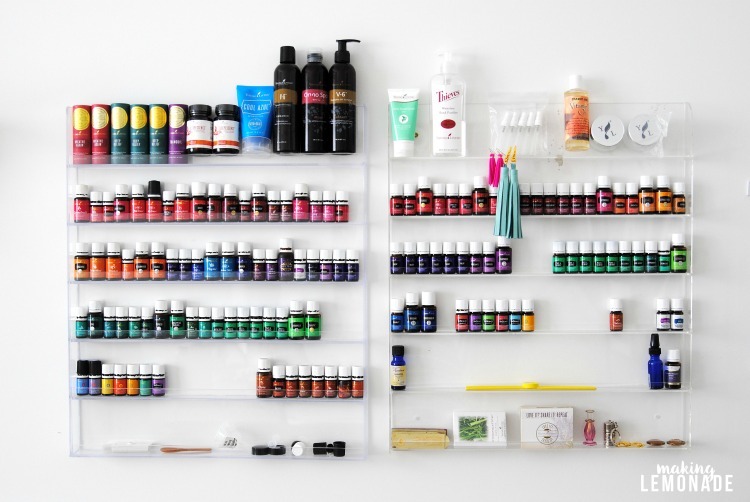 Girl, you are ORGANIZED!!!!???? ?